Photos copyright Arizona Foothills Magazine, 2009. Arabian architecture and design detail has always held great appeal to me. Just look at those windows, arches pointing up to a golden dome in the ceiling. A perfectly dramatic, yet somehow not over-the-top, way to frame a beautiful Arizona view. 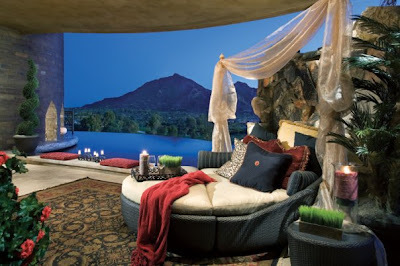 A three-walled outdoor room, overlooking an infinity pool, which in turn overlooks a portion of the valley east of Phoenix. Although you can't see it in this image, I'm wondering if there is a large glass sliding wall that can be closed between the rug and the pool ledge so that view can be enjoyed on our chilly desert winter nights. "Arizona Foothills Magazine teamed up with builders F.O. Buck and Brent Buck of Paradise Valley Mountainside Homes and 18 of the Valley's most talented design firms to create the $20 million Showhouse. 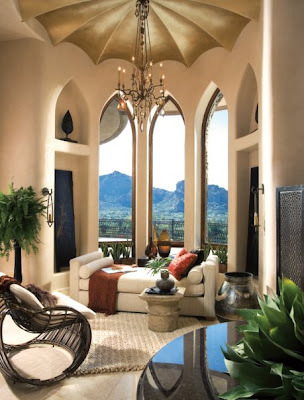 The home, rooms and designers will all be featured in the April 2009 Showhouse issue of Arizona Foothills, and 100% of proceeds from the accompanying tours will benefit Valley charities. Xavier College Preparatory's Scholarship Fund. *All guests will park for free at the Montelucia Resort & Spa, and take a free shuttle to and from the home. *The home is the most expensive spec home ever in Arizona, and 20,000+ sq.-ft."
I think I might have to visit and dream! According to director Saam Gabbay, "The Jem video is a photofilm made from 25,632 photographs shot over the course of 10 hours... Jem is an incredible storyteller and has an intuitive and refined sense for what is right for her. Sitting in the edit together we reflected on our first conversations and how the project had unfolded quite magically, especially in the face of a very tight deadline. From start to finish was exactly 2 weeks. Jennifer Geirsbrook and her team did a remarkable job styling the shoot and we enjoyed a deeply collaborative spirit throughout production with everyone. Most amazing was the speed at which Jennifer, Kathy and Aviva worked to transform Jem for each shot." 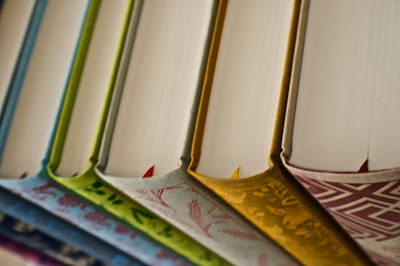 Remember those beautiful books I posted about a few weeks ago? I found them at an online Canadian bookseller called Chapters via another blog (now I can't remember which blog, and that makes me sad) and treated myself! Photos copyright Bloom Creatives 2009. All rights reserved. 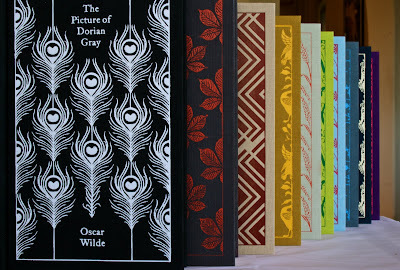 Despite the fact that I already own five of the ten in much less beautiful formats, I bought the full set. How could I not when they are just so perfect? And they are meant to be a set, as they are all numbered along their spines. 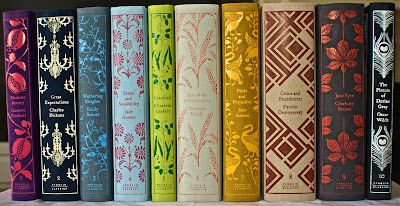 They have found a home on my bookshelf in our master bedroom for now... They may end up in our guest room when we redo it. After I read them all, of course! 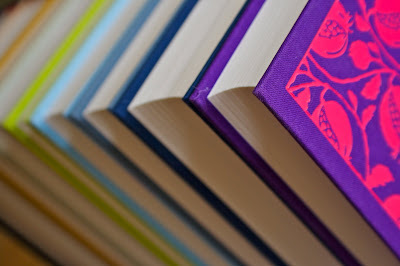 Image Copyright 12Fifteen. All Rights Reserved. 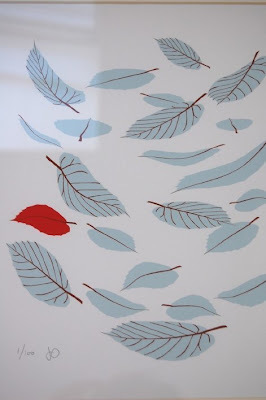 Isn't this a lovely print? I found it while clicking around through Supermarket, a very cool Etsy-esque shopping site. Designer Johanna Anderes is the designing force behind the great little letterpress shop 12Fifteen. I would hang this in a nursery for a baby boy... If you're so inclined, act quickly -- it's a second printing of a limited edition. ...and so has this little lamb. Copyright Bloom Creatives 2009. All Rights Reserved. In the 1930's, Boyce Gully of Seattle, WA found out he had TB. That very day he disappeared from the lives of his wife and toddler daughter, Mary Lou, forever. Unbeknownst to them, Boyce wound up in Arizona where he staked a gold mining claim and began to build a castle for his daughter, as he had once promised her. Boyce thought he only had months to live - but he lived another 15 years and died of cancer, not TB. His wife and daughter had no idea where he was until they were notified of Mary Lou's inheritance upon his death: the castle. Mary Lou and her mother moved to Arizona immediately and found this strange dwelling that Boyce had made completely out of found, repurposed or donated materials, including items from the governor and Frank Lloyd Wright. Mary Lou still lives here -- she must be at least 80 by now -- and says to this day she occasionally finds things in secret hiding spots her father left for her, like money and photos. Mary Lou also has a penchant for cats. Her current feline companion is named Cleocatra. 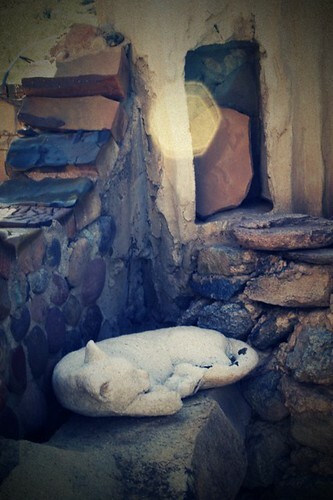 She keeps lots of inanimate cats around, too, like this stone kitty napping in the sunlight on one of the many patios around the castle. Copyright Cathy Nichols, All Rights Reserved. So much beach-themed and coastal art is so kitchy - and not in a cool, retro-kitch kind of way. There's only so many pink sea shells and talking crabs one can take, no? 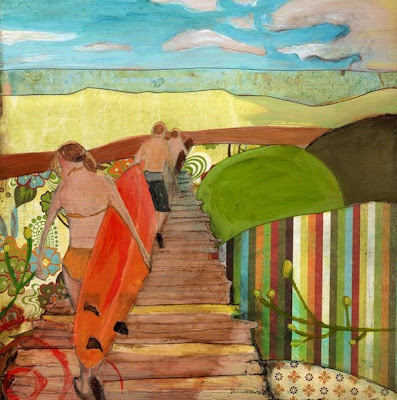 So I was happy to find artist Cathy Nichols via the blog A Studio with a View today. I would base the interior of my funky fresh beach house around the colors in this... Actually, the colors I used in my desert dwelling are these same colors! Must be why I like it so much. Cathy, of course, does not-beachy work too. 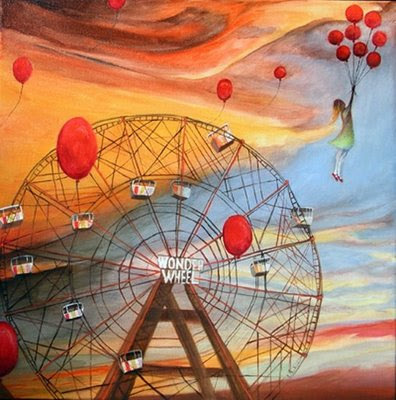 I particularly love this Ferris Wheel painting, which reminds me of so many of the vintage-feeling Polaroids of the same subject floating around on FLickr.